SEOUL, South Korea, March 21, 2018 /PRNewswire/ — On March 19, 2018, in the Republic of Korea, the Italian luxury brand Tonino Lamborghini and Korean global ICT Corporation DASAN Invest, Co, Ltd. signed the agreement for the new joint venture, called TL International, Inc. The signing event took place in the office building of DASAN at Pangyo in presence of Tonino Lamborghini SpA company vice-president, Ferruccio Lamborghini, and DASAN president, Nam Min Woo. After 2 years of collaboration between Tonino Lamborghini and DASAN Networks, an affiliate of DASAN Invest, Inc., in the IoT sector, thanks to the success of the ALPHA ONE smartphone in the Middle East, Russia, China, South Korea and UK, the two companies have decided to join their forces for a new ambitious project and to invest in a synergistic way in the sector of premium IT accessories. The new joint venture corporation, TL International, Inc., will sell worldwide Tonino Lamborghini technology accessories with the collaboration of the finest OEM tech partners. Furthermore, the new JVC will develop Tonino Lamborghini branded luxury tech accessories with other international innovative licensees and partnerships. 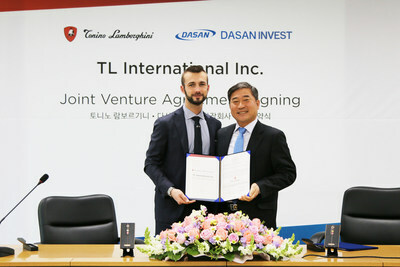 Based in South Korea, TL International, Inc. will be composed 70% by DASAN and 30% by Tonino Lamborghini. The company is managed by a team of international professionals from Italy and South Korea with a solid expertise in the luxury and technology market. Ferruccio Lamborghini will be a key member of the board and brand representative, Nam Min Woo will be the chairman of the board of directors, Byeon Ji Hwan the CEO and Andrea Casa, Tonino Lamborghini COO, will be member of the board. The company was founded in Italy in 1981 by Tonino Lamborghini, heir of the Lamborghini family. Taking inspiration from the Italian industrial design and the Lamborghini family mechanical heritage, he has developed a lifestyle experience brand with a range of luxury design products, including: watches, eyewear, mobile phones, perfumes, furniture, clothing, sports accessories, signature beverages, 5-star boutique hotels, real estate projects, cafés and restaurants. DISCLAIMER : Tonino Lamborghini company and the registered trademark “Tonino Lamborghini”, which brands luxury goods and services, shall not be confused with the Automobili Lamborghini car company founded by Ferruccio Lamborghini, Tonino Lamborghini’s father, but today belonging to AudiVW Group. Please avoid the usage of Lamborghini cars next to Tonino Lamborghini products. DASAN Invest is a holding company with tens of subsidiaries including DASAN Networks. Since the establishment in 1993, DASAN Networks provided advanced communications technology through its affiliates in Japan, Taiwan, Vietnam, France, India, America and all over the world. With a continuous growth, DASAN Networks has become one of the top 10 FTTH network solution provider in the world. Since 2016, DASAN Networks is the official Tonino Lamborghini brand licensee for IT devices.The HQ is located in the Republic of Korea, and it is now expanding the business to B2C with the affiliates as a new growth engine. (www.dasannetworks.com). ALPHA ONE is an Android smartphone with Dual-Sim slots dedicated to luxury clients and international businessmen. Inspired by Lamborghini family’s mechanical design, it is made with handcrafted Italian leather and liquid metal. The 20 MP camera, the 3D Dolby Atmos digital speakers and long lasting battery make ALPHA ONE the perfect phone for any executive business man. For more information: online official e-shop (www.lamborghinimobile.com).